Viggo Mortensen is again sporting facial hair and traveling through a strange land, but this time he’s leaving behind the hobbits and elves for a trek on The Road. Our shots from the post-apocalyptic tale are a tad on the solemn side, so turn the page to see some more comical imagery from the week…. 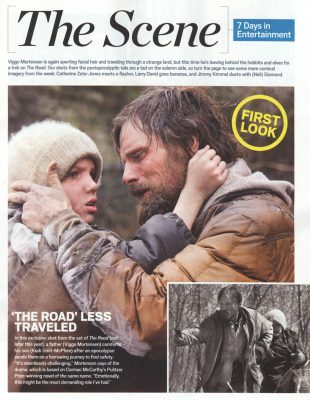 In this exclusive shot from the set of The Road (out later this year), a father (Viggo Mortensen) comforts his son (Kodi Smit-McPhee) after an apocalypse sends them on a harrowing journey to find safety. Published May 30, 2008 in Entertainment Weekly #994.